The Middletown Insider: Disappointed in Mayor Drew’s Conduct? Here’s What You Can Do About It! Disappointed in Mayor Drew’s Conduct? Here’s What You Can Do About It! 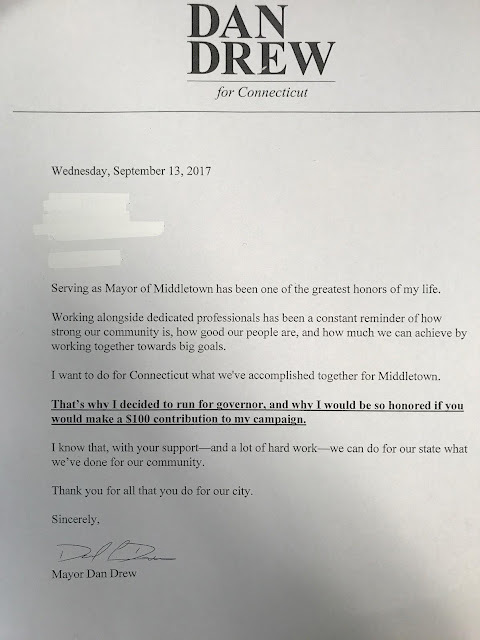 The Prologue: On September 13th, Mayor Dan Drew, a Candidate for Governor, sent out letters to City Employee’s homes, soliciting a $100 Campaign Contribution. The big issue is, he also sent this to all Police Officers, and Firefighters, whose addresses are always sealed, and suppressed, to everyone. We now know he, or someone in his Campaign, illegally accessed these addresses and sent the letters. That, by itself, is an illegal practice clearly defined in the State Election Enforcement Commission’s State Statute on Illegal Practices and is an offense which in the past, has incarcerated other Politicians for similar matters. There is also the matter of at least 3 Ethics Code Violations he committed in the City. 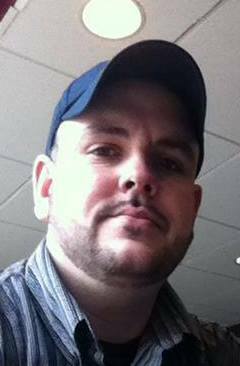 In this article, I’ll explain what laws, and ethics codes he violated, and how you can help the State make sure he is not only removed from the Governor’s race but possibly impeached as Mayor of the City of Middletown. First, people believe were are a strictly Republican backing publication. While it’s true we are Conservative Minded, we are after the truth, plain and simple. And the truth is just that, the truth, and it takes no sides. Second, people may think I’m on a witch hunt for Mayor Drew, and that’s not the case. Do I support his political agenda? No, I don’t. I think that agenda has hurt the City, and he’s made some poor choices along the way. That’s not this issue here, however. 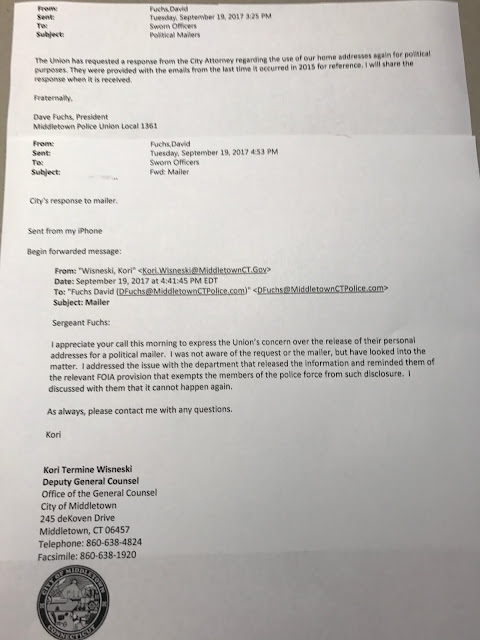 The letter he sent City Employees, specifically soliciting a $100 Donation, especially sending the letters to Police, and Firefighters whose addresses are sealed, is a violation of Connecticut General Statutes, Chapter 155, Section 9-622 “Illegal Practices”, Article 12. What does that say? You’re about to find out! This brings you to the “Forms” Page on the SEEC Website. You’ll choose “Complaint”, and it has a great step by step guide on what to do. An important note: You will need it Notarized, and I recommend sending it Certified Mail, with a return receipt. Altogether, figure on around $10, unless you know a Notary. The more people that send complaints, the stronger the case is, and the quicker Investigators with the State shut down his campaign. He’s not a great Mayor, and I can’t imagine a Drew Governorship. Kleckowski believes that this incident, where an Illegal Act was committed by our Mayor, and 3 Ethics Codes, of The City of Middletown, needs to be brought before the council to be discussed. It’s the opinion of many that these offenses could lead up to a possible Impeachment. I’d like to add that I believe these meeting should be open to the public. § 40-4. Standards of conduct. (A. )Officials and employees have an obligation to act morally and honestly in discharging their responsibilities. § 40-5. Use of City resources. property and City personnel may be used only for the conduct of official business, except where such resources are available to the public generally. (A.) No official or employee shall, without legal authority, disclose confidential information concerning the personnel, property, government or affairs of the City. (B.) No official or employee shall use confidential information to advance his own financial or personal interests or the financial or personal interests of any other person. The Councilmen & Women that we’ve all elected, either Democrat or Republican need to take this up and have a Council Meeting on it, with public input. I will include the names of the Council Members at the end, and you should call them to take on this total violation of our City. I’ll close with this: This is not, and I repeat, is not, a Democrat, or Republican Issue. It just isn’t. This is a matter of our highest elected official abusing his power as Mayor, and violating City Ethics Codes, and Campaign Finance Law. This is a matter of right and wrong. Period. Do what is right, not what is easy. Please call your Council Members, and tell your elected officials that they need to act against Mayor Dan Drew! The Truth is not political, it is what our elected officials owe us! Please check for an article soon on what others are saying about these heinous acts committed by our highest leader in Middletown, soon only on The Middletown Insider!